For the first time in UFC history, fans have witnessed a beast get tamed after Nate Diaz defeated Conor McGregor by submission yesterday (Saturday, 5 Mar 2016 – Las Vegas). Social media went into uproar after watching the Irishman's winning streak come to an end at UFC 196 which took place at MGM Grand. A lot of MMA enthusiasts were left happy to have the hype machine have a taste of his own medicine in which he called it a "bitter pill to swallow". McGregor and Diaz had a heated interview trading insults and swings at each other. The 27-year-old however praised his opponent saying, "I was inefficient with my energy" and "It was a battle of energy and he got the better of that." After defeating Chad Mendes and Jose Aldo, McGregor moved up 25 pounds weighing in at 168 pounds to fight a bigger man in 170-pound Diaz, and that difference in size played a huge difference. "Usually, when I fight a man in the division I am champion in and they crumble under those shots. But Nate took them very well. I think the weight allowed him to take those shots well." McGregor trying not to fall after a strong punch by Diaz in the second round. McGregor took the first round landing many punches to Diaz's head but the American did not go down like McGregor's previous opponents. The second round showed McGregor's fight but Diaz rocked him with a right hand that clearly gave him the upper hand. 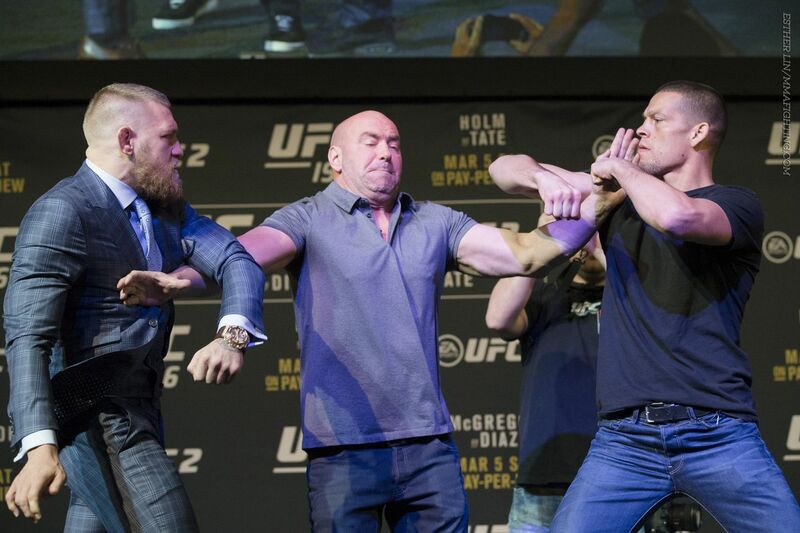 There, Diaz landed ground and pound, got into mount, took McGregor's back and tapped him out with a rear-naked choke. McGregor is not all sour about his loss, he was glad he loss to a worthy opponent saying, "I enjoyed the fact that a person could take the shots and keep coming. He kept his composure. He went into almost autopilot mode with the shots. His face was busted up. And I went into panic mode. It was just a shift of energy and he capitalised on it. I think with a bit of adjustment and a bit of recognition it must take more than one, more than two, more than three to put the heavier man away. I think if I go in with that mindset at a heavier weight I think I will do fine again." Now, UFC's loudest star said he will be ready for UFC 200 in July and is probably going to defend his 145-pound title against Jose Aldo or Frankie Edgar at the new MGM Arena.